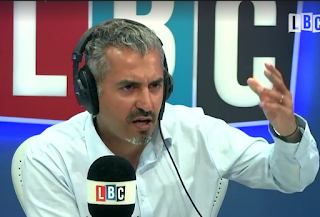 The decision of the Trump administration to cut US funding to the agency dedicated to the care of Palestinian 'refugees' has provoked lively debate - not least on Maajid Nawaz's show on LBC radio on 1 September. Maajid introduces the show by applauding the Trump decision, yet expressing misgivings that the demise of UNWRA would have a destabilising effect on an already unstable region. The first caller to join the debate is Salman of Mill Hill (1:21 into the programme). Salman is an Iraqi Jew whose uncle's brother-in-law was executed in Basra by Saddam Hussein. He puts the case for the Jewish refugees from Arab countries: where is the fairness, he asks? At 1:25 Niran from Edgware also rings the show. She mentions that there were almost a million Jewish refugees. No other set of refugees in any other conflict had an UNWRA or any other body to care for them, she says.They were some 52 million refugees since 1948. There was no audio to listen to. What happened?